Teaching an African Folklore Embroidery class is one of my favorite things to do. 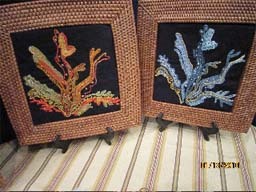 In the last few weeks, I have taught workshops at quilt guilds in Washington, Visalia, Long Beach and Covina. I have had all types of people in my classes, from people who have been quilting for many years, but never done any hand work, to sophisticated stitchers , who have been doing all types of needle work, such as red-work, hard anger, Brazilian embroidery and needlepoint for many years and each time students express words such as fun, invigorating, out the box, creative and inspiring when they are complete with the class and see the results of their work. But the truth is that my students inspire me. Last week, I had a women in my class who had purchased several of our kits over the years and had only been doing the chain stitch, which looked great, but when she learnt how to do the Mola Barbara technique and the doubles sided Interweaving technique on top of the chain stitch, she was so excited. These techniques, illustrated in my book, Safari through African Folklore Embroidery, take the ordinary to the extraordinary, making the African Folklore Embroidery into both a surface embroidery as well as a fiber art when you start adding silk ribbon, raffia and metallic thread to the embroidery using the Mola Barbara Interweaving Technique! Two weeks ago, I had a women in my class, we will call her “pink lady” as she was dressed head to toe in pink, she came into the class convinced that this African Folklore Embroidery “ was not something she would be able to master as her grandmother had always told her that her stitches were not neat and consistent enough. Well one of the most important rules of African Folklore Embroidery is that like life, your stitches do not need to be perfect. There are no needle art police who are going to come to your house in the middle of the night and inspect the back of your embroidery or the fineness of your stitches. Well, Pink Lady, had so much fun she stopped worrying about her stitches and enjoyed herself so much, she is complete with one kit design and already on the next, loving every minute of it. One of the most treasured moments, was last weekend, I had given a lecture on the Thursday, titled Safari through African Folklore Embroidery in the evening on how tea drinking is such an important daily ritual and part of life n South Africa and how it is always drunk from a cup and a saucer, well one of the women in the class, a complete stranger that I had never met before, brought a beautiful tea service, fabric napkins, china and silver spoons and served the most wonderful tea. It was such a treat and so thoughtful. It is this kind of thoughtfulness that one often encounters amongst women who do needle arts and quilting, for this I am truly grateful. This month we are giving away two kits in the summer sea series, the coral design and the shell design. If you are interested in winning these, email me at info@aflembroidery.com, subject line- competition. If you would like to win one of our summer design. 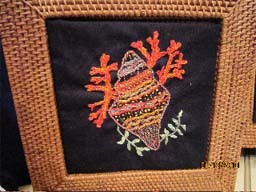 To view either the Coral or shell design, view website at www.aflembroidery.com. To get ideas for your African Folklore Embroidery Kit design, you can have a look at some beautiful completed design as well as winners and entrants in our challenges and exhibitions. We have some exciting lectures and workshops coming up and if you would like to receive the upcoming schedule or are interested in scheduling a lecture or workshop for your group, please contact me. Remember I love to see what you are working on, so send me pictures, you never know they could be in the my next book! Winner will win these two kits. 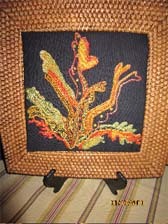 Embroidery Advisor Presents Appealing Animal Apparel Got Thread? ?